The Venecia Gris is an elegant feature wall tile that is suitable for use in bathroom walls, including shower walls. Characterised as an off-white tile with a curved, layered, diamond-like pattern, this feature tile offers a clean and attractive finish. The Venecia Gris feature wall tile measures 300x900mm and are sold per piece. There are 3.7 tiles to a square metre. Add a touch of class to your new bathroom. The Venecia Gris feature wall tile has been specially manufactured to withstand high moisture areas and to be installed with minimal grout on bathroom walls including the shower. Enjoy superior quality. 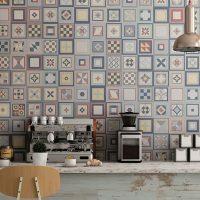 The Venecia Gris feature wall tile exhibits high-quality manufacturing and is built to withstand the test of time. Rest assured that this feature tile will last you many years to come. For elegant looking feature wall tiles in Perth, choose the Venecia Gris from Ross’s Discount Home Centre. 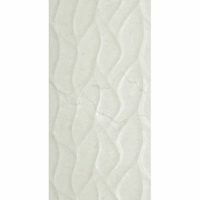 Buy this attractive feature wall tile at the lowest price in the market from our online store today!